BIG RIG SITES!! 50 AMPS!! WIFI!! We can handle your big rig with our long level pull thru 30/50 amp sites. We have high speed Internet access and we're close to restaurants & shopping. Stay with us once and you'll keep coming back. We also welcome rallies. Very well-kept campground. Nice pool, clean neat landscaping, shady, wide and long big pull-thru sites with near- level gravel base and grass between the sites. It is adjacent to I 24 so there is some noise from traffic, but not as bad as I would’ve thought. There is a bar wIth an outside concert space at the exit that was playing loud music on Friday night that was a bit disturbing. Park is convenient to shopping, restaurants etc. The park Wi-Fi is some of the best I have experienced, there is a free option which are used, but if you want to stream videos you can pay for upgrade. In my opinion, 1. The OFFICE STAFF gets a FIVE STAR!! They were very pleasant, attentive and thorough. 2. The site is roomy, leveled and well-packed rock-bed site, excellent shade. 3. The price point for a 38' FULL hookup pull thru was great. 4. Clean restrooms. 5. We were not surprised by the hum of traffic from nearby I-24, but it diminished of and on throughout day and it was not a factor for us at night as well slept uninterrupted. 6. The park is conveniently located to a number of shops, restaurants, diesel stations, etc. 7. The park is a short drive to the Cumberland River Center and Park, which offers a pleasant roundtrip mile walk along the Cumberland after dining at the top restaurant in town -- The Catfish House. We will make this a stop on our travels as well as recommend it to others. The sites were level and well-spaced. The manager was friendly. The restrooms were clean and had hot showers, though you had to be patient for the hot water. We had a good WiFi signal, but their internet connection kept dropping out. The highway and recycling center noise weren't a problem - it was 30 degrees so all our windows and doors were shut. Staff were as rude as I've ever dealt with. Right off the highway a lot of road noise. Priced like it has concrete and cover for your camper and has neither. This is one of the better campgrounds we have stayed. A very nice place to stay after a long day/night on the road, or for an extended period. Easy access off I-75, restaurants, stores, and gas. Everything was clean and well kept. The staff was sociable and helpful. My only concern was the restrooms/showers could have been more ADA compliant with rails and extra space. Of course, for warm weather travelers, the pool is a great addition. We came back a second time this year, because it's such a nice place to stay over and the spots are reasonably level and wide enough so, pulling in is easy, even when tired. The best endorsement we can give is, we'll be back! We stayed for two nights with two dogs. The site was gravel and flat. We used the shower facility and it was very clean and handicap-accessible. There was not cable tv but there were 6 Chanel’s clear with the antenna. There was WiFi, but it isn’t strong. The sites are wide and packed well. The surroundings are not ‘overly loud’ and they run during business hours, and they aren’t super loud. We will stay here again, it is a nice park. The office staff was efficient and friendly. Campground has trees. Our site was level and pleasant. It has a dog park area for letting dogs off-leash; ours enjoyed it. My only complaint is lack of hot water for the showers in the bathhouse. Only one of three showers had hot water. The bathhouse was clean but low rating due to no hot water. Thank you so much for recently staying with us! We were not aware that the hot water was not working properly. Thank you for bringing it to our attention so we can look into the issue. The dog run is new so we are pleased your pups had a good time stretching their legs. The site is just off the highway, level gravel sites, and nearly the only site that had working Wifi. Would stay again if my travels took me past this area. We stopped here as an overnight from our trip to and from Pigeon Forge. Very easy access to the Highway and we had no issues with the hook ups. The sites are level and we had enough room for our slide outs. Since we were only on an overnight we did not use any of the facilities. The staff was very pleasant and helpful. The gift shop/RV store was nicely stocked. Since the park is right off the highway it is a bit noisy but not so much as to be disrupting. The pull through sites were very easy to access. A great little stay over spot. If you are looking for a quick one-night stay close to the interstate than this place is a good option. The staff is friendly, the gravel sites are fairly level with small grass side yards and a few trees. The park overall is very well maintained. The only two drawbacks are the wifi offered is nearly worthless (connects but most of the time there is not enough signal to be effective), and the second largest drawback was the noise. On one side of the park is the interstate and on the opposite side is a very noisy (and a bit smelly) metal recycling facility. If you like walking/biking there is a nice greenway within 20 minutes that offers a nicely maintained rails-to-trails walk (from the parking lot 2 miles out in one direction and 2.6 miles out in the other - totaling 9+miles round trip if you do both sides). Downtown river walk is nice but only phase 1 is completed so too short to bike, but nice walk. Easy access from I-24. When you arrive at your campsite, you will find out just how close your are to the interstate. Loud. Pleasant efficient staff. Well manicured gravel roads and pull through pads, almost level. Some trees, but you may have to ask for a tree site (recommended). Nice park, but too loud for me. We stayed here one night to visit with daughter (Army) on our way down to Louisiana for our next job. Park was clean, tidy and quiet. Nice level pull through site. Management was pleasant and helpfull. It's our go-to place to stay when visiting the children/grandchildren in Clarksville! The sites are nicely laid out, easy to access and maneuver into. Sites are gravel but well compacted and level. Hook-ups are convenient and very well maintained. WiFi is available (free!) and does nicely for email and general web surfing. Cell phone reception is excellent, no problem anywhere in the park. The park is immaculate---no trash, debris, anything on the ground. The picnic tables at each site are very clean and in good shape (structurally). A BIG plus during warm weather (we visit off-and-on during the entire year) is the outdoor pool; it's big, the surrounding deck is nice, and the water is clear and clean as can be. We've used both the laundry and restrooms/showers on occasion and they were clean and everything (plumbing, appliances, etc.) worked fine. The store at the park is nicely stocked with the basics and we were impressed with the reasonable pricing on everyday necessities. 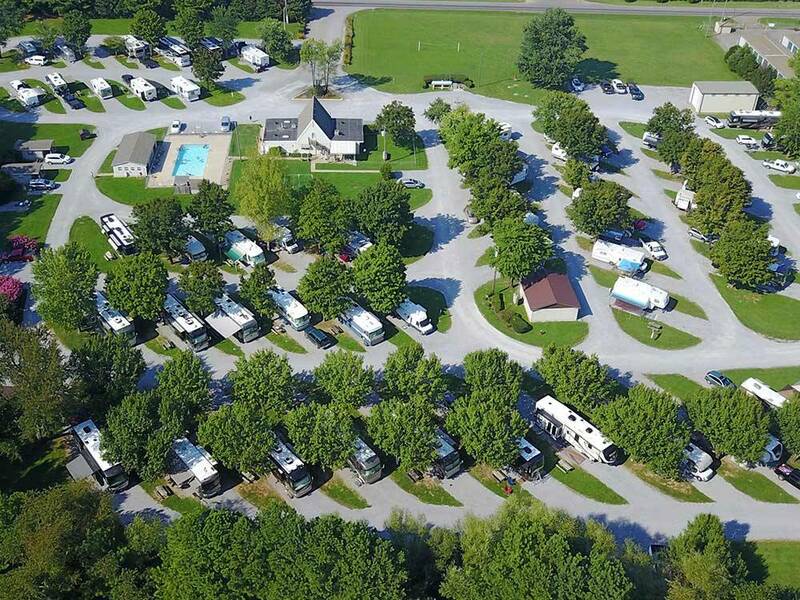 To top it off, the owners/staff of Clarksville RV Park are great to work with and they take a great deal of pride (we think) in both customer service and the appearance of the park. It's nothing flashy but it's clean, well-run, and a good place for either an overnight stop or an extended stay. Five Stars from us!! We stayed 2 nights while traveling through the area. The park is close to I-24 (Exit 1: SR-48, Trenton RD) but there is very little noise from the Interstate. However, there is a metal recycling business across the street that was operating from early morning to evening. The park was well cared for and landscaped. The pool was closed for the season. The interior roads and site parking pad are gravel. Some of the roads were narrow with tight turns. Almost all of the sites appeared level even though there was a slight slope to the ground. There is not much privacy between the sites as the sites are close to each other. The pull through sites were long enough for coaches and their toads. They have full hook ups – water, electricity (50 AMP), & sewer. The utility connections were towards the middle of the sites. There was an outside table but no fire pits in the RV area. The trees around the park & the tree canopy made satellite reception hit and miss depending on site assignment and your dish configuration. The park brochure showed 6 broadcast channels. Didn’t try to get any broadcast channels. The provided WiFi was good. There was no cell phone reception (NET10) in the park but there was a pay phone available. No designated fenced pet area. There were a couple of designed pet areas around the park and there was sufficient area to walk dogs along the park roads. There were a couple of dumpsters around the park to dispose of waste. There were a few long term residents. They were in a different area of the park from the short stay residents. The presence of the long term residents wasn’t a negative impact on the park. For being in a hazardous/severe weather area, there was no underground storm shelter. No structure was identified as a severe weather shelter. Probably would stay here again if traveling through the area but wouldn’t stay for more than a couple of days. We stayed here for five days while my wife attended a watercolor workshop in Hopkinsville, KY. Interior roads are all gravel and well maintained. The sites are level, well defined, and long enough for my 40' motorhome and tow. WiFi is free and the best we've ever had. A review on another review site complained about a junk yard across the road, but it didn't bother us. The staff was friendly and helpful. I would stay here again.